It’s time for the USA to battle European again for the Ryder Cup. Find all the betting offers for both new and existing customers in our preview. The USA starts the Ryder Cup as favourites in Paris. They haven’t won on foreign soil for 25 years, but benefit from strength and depth in contrast to Europe. 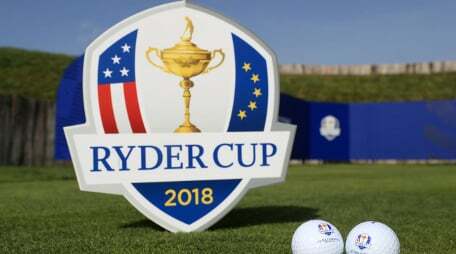 This year the Ryder Cup is being hosted at the Le Golf National. Many of the European Team members will be more familiar with the course as it features on the European tour circuit. Team USA had time to prepare earlier in the week, but the wind conditions were very different to how they are for the tournament and are forecast to build. The pressure felt by the highest ranking pros will be exceptionally high. There are a couple of standout holes where they will feel this the most. It doesn’t start easy with the first hole as it features water and a large grandstand presence. The atmosphere on the first hole will be electric and landing a good first shot will be a great confidence builder. The 15th hole provides another opportunity to tripover, with a lot of water in-play. Europe will need the likes of Justin Rose to be at the top his game to retain the Ryder Cup. A lot of attention will be on Tiger Woods after his recent triumph, and perhaps the USA can leverage this to build better repour within the team. Something that has been lacking in recent tournaments. New customers can take advantage of welcome offers. For the full list of welcome offers, see the My Betting Sites homepage. Bet £10, and Bet Victor will give you £50 in free sports bets and a £10 casino bonus when you visit via My Betting Sites. Terms and Conditions Qualifying bet must be placed at odds of 2.0 or greater; £50 Free Sports Bet split into 5 bets of £10 each, valid on set events only; **Wager must be 40 times the Free Casino Bonus in order to withdraw winnings. Credit or Debit Card deposits only; Deposit and bet of £10 required within 7 days of opening new account, T&C apply. Bet £20 and get a £40 free bet with Unibet when you visit via My Betting Sites. Terms and Conditions New customers only. 18+, BeGambleAware.org. Minimum deposit £10. Place any sportsbook bet (except Racing) of £20+ at minimum odds of 1.40 (2/5) to receive your free bets and casino bonus. 35x wagering on casino bonus. Free bet will expire 7 days after opt in. £20 Casino bonus will expire after 30 days of opt-in. Bet 365 is the most popular UK bookmaker. Register now and enjoy many benefits. Bet £5 and get £20 in free bets with Betfred when you visit via My Betting Sites. The match play format of the Ryder Cup means we don’t see the more traditional golf betting offers seen on the PGA Tour, but get something a little different. The Ryder Cup has a massive profile, and it means we see offers from bookmakers that we don’t normally. The ability to create your own requested bets has risen in popularity over the past year. Almost all bookmakers offer the ability to do this, and Paddy Power’s product is ‘WhatOddsPaddy’. They have an offer for the Ryder Cup on the first day. Get your stake back as a free bet if your bet loses. Maximum refund of £10. 888sport are giving a £5 free bet to players who stake £25 on any day of the Ryder Cup. Your £5 free bet can be used on any golf market. Bet on the ‘Winner’ market prior to 18.00 on the 28th Sep, and Betfair will give you a free bet equal to half of your stake. There is a maximum of a £5 free bet that will be awarded. Boylesports’ normal money back offer doesn’t work with the match play format, so instead, Boylesports are offering acca insurance for the Ryder Cup. Get your stake back as a free bet if one leg loses. There is a minimum bet of £5 required, and a maximum refund of £20 available. Each leg must be priced at 1/2 or greater. You must opt-in to receive this offer. USA vs Europe, Who Is Favourite to Win? Bookmakers can’t look past the strength and depth of the USA team and have made them favourites to win the Ryder Cup. The odds are supplied by bet365, are accurate at the time of publishing and are subject to change. Using our odds conversion tool, this provides the USA with a 57% chance of winning. Compare that to a 40% chance of Europe winning, and you can see that this Ryder Cup is very much open. The Ryder Cup is exclusively on Sky Sports, on the Golf Channel. You can stream the action via Sky Go.